Work on Prineville's new splash pad is poised to take off in the next few weeks as warmer weather has opened the door for construction. According Wayne Looney, who has helped spearhead the Kiwanis Club of Prineville project, local concrete contractor Joe Floyd and Sons began pouring walls and pads to support an incoming restroom/equipment room structure. The structure itself has already been pre-fabricated and will likely get installed within the next two weeks. "It will not be finished," Looney clarified. "It will need to be caulked, painted and that kind of stuff, but it will be sufficient for people to work in it." 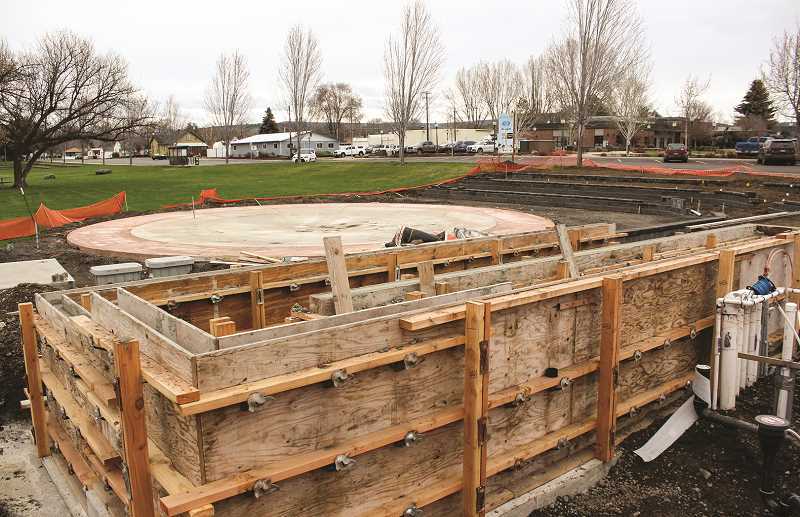 Once that structure is built, Anderson Pool Works will return to Prineville and install the rest of the splash pad plumbing necessary to make the attraction function. Meanwhile, Rosendin Electric will install remaining electrical equipment for lighting features in and around the splash pad. All of the rough plumbing and electrical conduit from beneath the splash pad and surrounding ground has been run to the future location of the restroom/equipment room, so contractors will be able to access it and complete the work. Looney went on to say that Anderson Pool Works has delivered four above-ground features that will be installed to enhance the attraction. Also, Wendels will soon be on site to complete the terraced seating near the splash pad as well as other landscaping, and local contractor Lance Romine is expected to complete the shading structures planned to shelter the terraces. Looney would like to see the remaining work on the splash pad, terracing and shade structures reach completion around mid-June — just in time for kids fresh out school to enjoy it through the summer. Based on his conversations with the many people involved, he believes that is a realistic goal. "I think by the end of April, there will be a lot of visible signs of improvement," he said. By mid-June, Looney would like to open the attraction officially and invite the community to try it out and enjoy it. "My idea is to have a dedication ceremony, turn on the water and have the whole thing pretty much done," he said. The Kiwanis Club initially announced plans to build a splash pad in Prineville in September 2017. At the time, the club's hope was to complete the structure in time for kids to use during the summer of 2018. Different hurdles along the way related to funding and securing of the Stryker Field site slowed progress of the project, so while work began on the splash pad in June, the completion date was pushed back to this summer. While that is the case, Looney points out that Kiwanis has benefitted from the financial and in-kind support of multiple residents and community businesses as well as city and county government officials. "This is a community-driven project, which would never happen if we didn't have collaboration from the community," he said. "I think that is the way the community can move forward, frankly." And while the project is still a couple months from completion, Looney and fellow Kiwanis members are pleased to see it taking shape and nearing the finish line. "It is relieving to see it coming to fruition," he said.